Canadian Wildlife Federation: Why are woodpeckers drilling holes in my house? Why are woodpeckers drilling holes in my house? To attract a mate/establish a territory. The good news is the woodpecker should stop this activity once the breeding season begins in the spring. To search for insects. If this is the case, you will typically see small, variable sized holes. To control this situation, you may need to control the insect issue. To establish a nest or roost site. Are you seeing large, round holes with woodpecker activity starting in the spring? If so, chances are this woodpecker is trying to establish a nest or a roost site. Any work to deter woodpeckers for this reason should be started immediately once the woodpeckers have started or waiting until the nesting season is finished. This will prevent disturbing the nest. It is illegal to disturb or destroy the nests and eggs of migratory birds such as woodpeckers as stated under the Migratory Birds Convention Act. As soon as the pecking begins, and before the woodpecker gets too established, try using the deterrents below! Long strips of aluminum foil, reflective tape (this tape is not sticky! ), or shiny streamers have been found to be quite effective at deterring woodpeckers. Just make sure they are long enough to blow in the wind. Colourful windsocks or flags hanging from your house may also act as a deterrent as they ripple in the wind and make some noise. 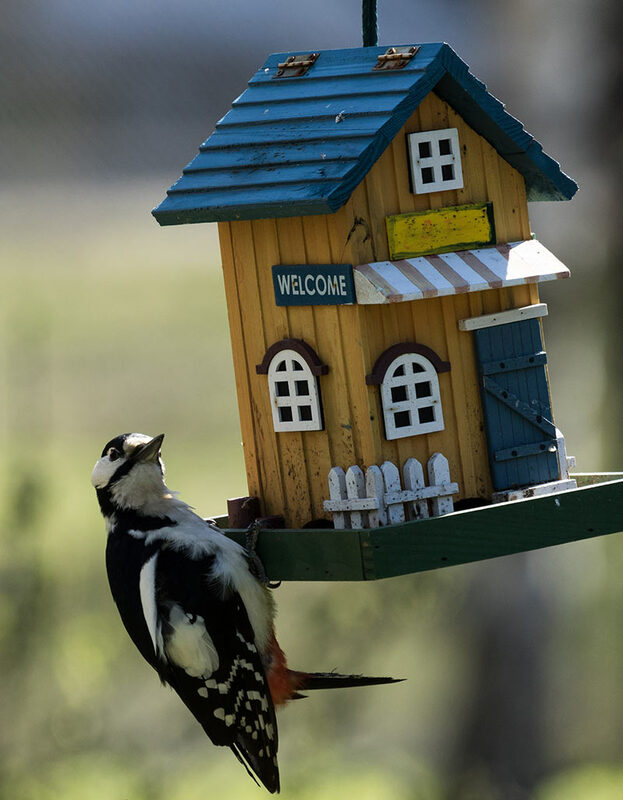 If woodpeckers are causing damage under your eaves, attach some light plastic netting from the eaves and angle it back to your house below the damage, making sure the sides are closed off. This should keep the woodpecker from being able to reach your house.